I got an iTunes gift card for Christmas. I had totally forgotten about it until I cleaned my room. I looked on the App Store for a good app to get, and I found Afterlight 2. It looked super cool, so I downloaded it. I’ve had it for about a week, and I love it so much. I love the fact that you can change pictures so much so quickly. I’ve edited countless pictures since I’ve gotten the app, and it’s never disappointed me. Thanks for the great app! It’s worth it! Highly recommend. 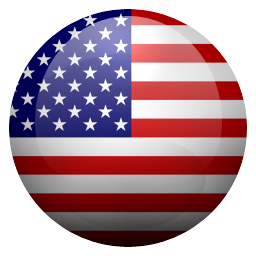 I just updated to version 2 to fix an issue I had with version 1 where the image wouldn't complete when tapping Done, it would just present a spinner. The same thing happens in version 2! And like another user mentioned, the interface turned black for me - when I tried Clarify. Perhaps these aren't compatible with the latest iOS - 12.2? Aside from that, the app feels smoother and faster than the first version. Great But Missing one Thing and One Minor Thing. Is There A Feature Where You Can See What the original photo look liked and compare and there's need to be a Touch Up Tool!!! For Blemishes or to smoothen out. In love with this editor. Just feel like it’s missing a few features. Some basic features including; a healing tool, more customizable grain effects, being able to reform shapes and such, and most importantly... an eyedrop tool! I seem to mainly use tools that mess around with color in this photo editor, and some colors i’d like to get perfect compared to another color in the photo I’m editing. Though, it is possible to just try and change the given color to fit another color, it’d be much easier and a lot more accurate to use an eyedrop tool. Love the app, though. I use it for graphics design and such. Thank you, developers! I’ve loved afterlight since the first iteration, years ago. it’s the most easy and beautiful! makes all my photos so much better ❤️ thanks afterlight! Nothing better than this app. Thanks. Bye . I’ve only been using this app for taking pics of food in my food truck for a few days. That said, it has 150% improved my photo abilities. The controls are intuitive and easy to use. Just take a little time to play around and see what it can do. This app will not work on my iPhone. Closes as soon as I try to edit a pic. This app made my pictures 10x better! I’ve been using Afterlight for years, but this new version is a whole new ballgame. It has every editing feature photoshop desktop has. It’s amazing. Highly highly recommend. I’ve tried nearly all photo editing apps and have yet to find one that is worth its bang for buck. This one came recommended by someone from Instagram after I saw their great quality photos. I took a leap and purchased it right before a vacation. It changed the game! Easy to navigate and use. My photos look incredible after I’ve spent some time on them with this app. 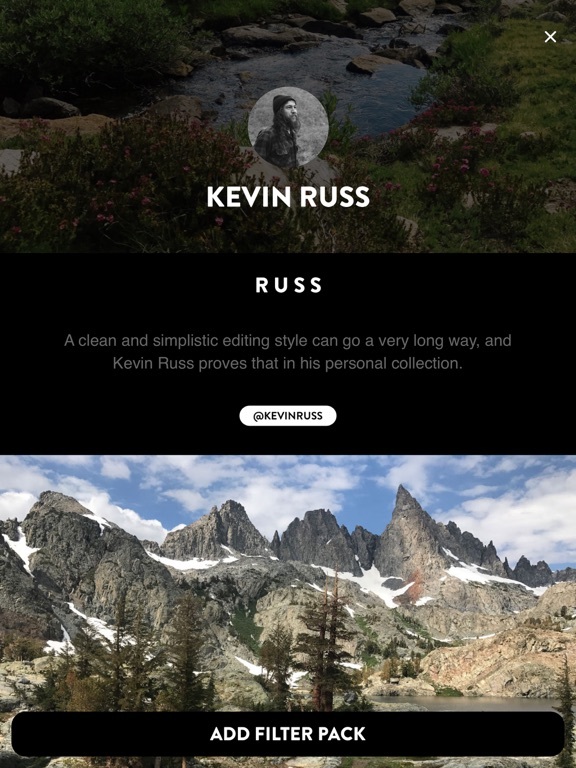 All I wish that they offered is a resizing option similar to VSCO. I don’t mean cropping, but an actual option to reformat the shaping for instagram sizing. Overall- worth every penny and then some!! One word amazing, no wonder people hype this app up so much it gives such a natural high quality look! Loveeee it! My new go to app! I like many of the tools in this app, but the blender needs some work. There is no eraser and you can't resize your foreground images. That's the main reason I bought it. I'll look around to see if I've missed something. Looking to layer photo on top of photo. Am I missing something or is this not possible with this app? I’m very disappointed in the lack of a free crop feature, even the free picsart app has that! Ever since deciding to buy this app, I have been SO glad! It’s one of the best apps for editing ever, and has options that are hard to find elsewhere. However, one thing that’s really frustrating is that changes don’t remain once saved when you’re editing in camera roll. This is important for me because I want the original photo modified, not have copies which are tougher to keep track of, especially when you need things in chronological order. Please fix this issue!! I love that this app has touch editing where you can go and specifically edit different parts of the photo. This is really only common in premium editing programs so I love that I can use this without the huge cost! I highly recommend this! This app is so good! I’ve been able to edit my photos so much better and it’s much, much easier! I’m in love with the new touch tools, they help you bring out whatever it is in your photo you want, and it’s really a ton of fun to play around with! I love afterlight and have been using it to edit photos for years. I recently upgraded to afterlight 2. 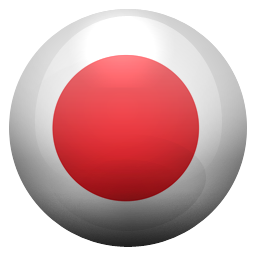 All of the fine tuning tools are great and in my opinion, now rival any of the major editing apps there are to choose from. 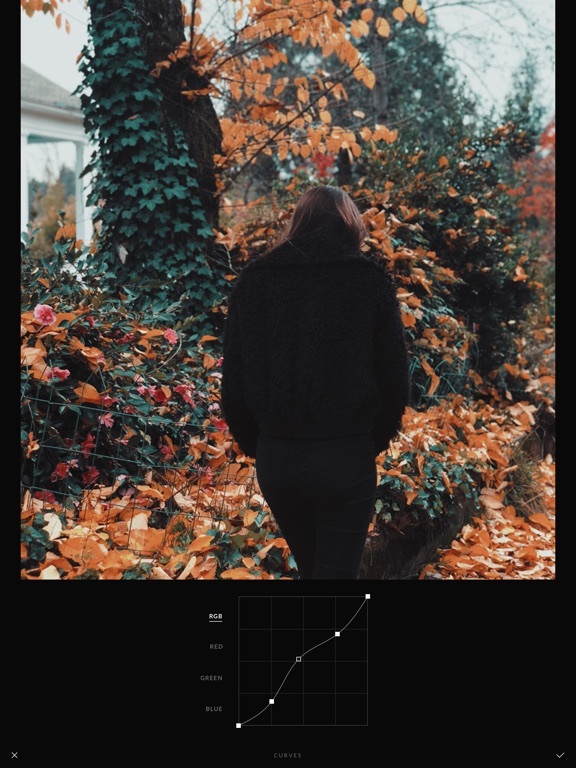 But as a long time user of afterlight, I found that a lot of the legacy filters that I’ve been using to give my photos their quintessential look for years are different in the new edition. Why even include them if they aren’t the same? 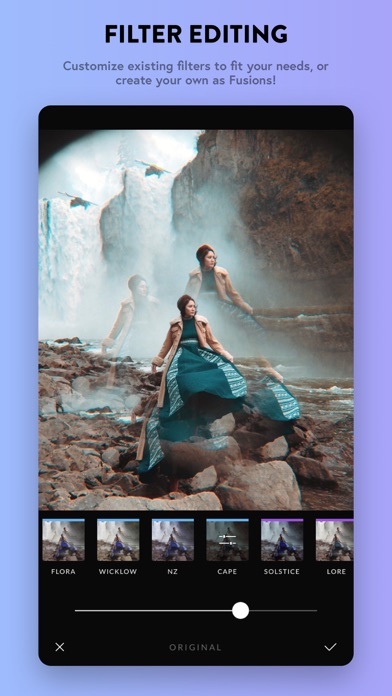 I’ve been processing photos between multiple apps for years which completely ruins the file integrity, and I really thought this would be the solution, yet even still I’m going back to the original afterlight for my final filtering. Great filters and effects, downgrades photos horribly. I’m absolutely loving the effects and filters but this app downgrades very high definition photos to an unusable level. I didn’t find this happening in my earlier use of the app...very strange! There’s no update available at the moment, so I’m not convinced the problem is on my end. Please look into fixing this staff, I know editing can downgrade any photo, but I shouldn’t be able to see pixels on a picture I took on a professional camera, especially for $3. Great editing app I feel like I won’t ever have to use another app to edit my photos since it has everything you need and it’s all free! But some more stickers would be even better! there’s not too much that makes this worth the purchase if you already have afterlight original. Not sure why they didn’t just update the original. I like the idea of the new touch tools, but can’t tell a difference after I use one. I tried them all on different photos and can’t see a difference. Maybe I’m doing it wrong. Maybe a little tutorial would help. It is definitely worth the few dollars, if you haven’t bought it already! I personally love the light leaks the most, and also the filters are diverse and perfectly designed. I consider it second only to Lightroom. Great app, frequent updates and features added. Sometimes it crashes with larger sized photos, but indeed an amazing application for photography! I used to use afterlight 1 but then switched to VSCO! I thought afterlight was gone but I was delighted to find the 2nd version! Just as great as the first. Loveeee it so much! I love that you can make your photos look super retro/vintage, & love the polaroid frames. Deff worth it! They actually charge you around $8 when you download it. The more I use this app the more I like it. It is intuitive and works advertised. This app allows the user to easily and creatively tansform images into works of art. 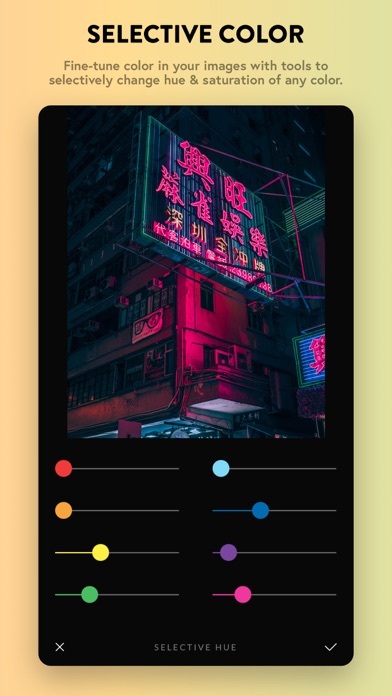 I would recommend this to any user wanting to enhance images or give an image a specific mood. I’ve been using After for as long as I can remember. My favorite editing app. There’s so much details one can add to create the best looking photos.. hence why I’m so annoyed.. I’ll be working on a photo for so long, then suddenly, the app crashes on me and I’ve lost all my hard work.. sometimes over an hours work. Not ideal for a photo editing app. I get so nervous editing now, that I’ll save it half way through just to insure that if it closes again (which it always does now when I use it) that at least I have it pre-saved. Well, to some extent. I think if the app is going to have this as an ongoing issue, maybe it would be wise and best to have a feature that automatically saves as you work. Sort of like when compiling an email or letter that keeps your work safe. Just helpful knowledge and suggestion. I prefer the first Afterlight app over this. I prefer the first Afterlight app over this second one because the first one is easier to navigate through AND the first one has white borders that you can put on a picture. I use the white borders to make my pictures fit into the Instagram square. I also recommended the first Afterlight app to my brother so that he can use it for his instagram pictures, too. I would only use this app if you can’t get the first Afterlight app. I have this second Afterlight on my Apple iPod because the first Afterlight app is not available in App Store sadly. If you guys put white borders into this app that would make it ten times better than it is now. Hey there, During edition ,the app suddenly close!and all of the editions destroys and i must again start it from the first point! !whats the problem? It looks like a great app but it’s not what I wanted to purchase and not exactly what I was looking for. After already using the first app the second one was of great quality as expected but like I said I didn’t find it fair that I had to pay again for the same product with some new additions. 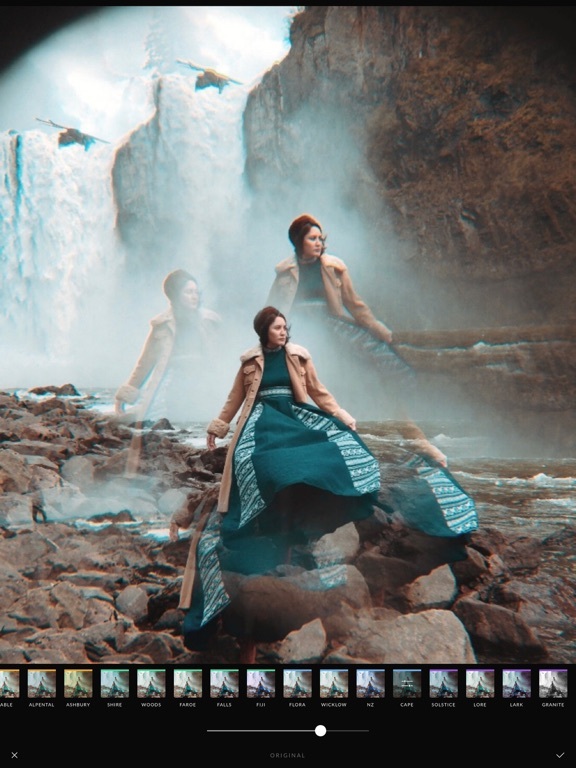 This is truly one of my favorite ways to enhance my photos! When I save pictures there are light horizontal bands in them. These bands are not in the original picture or when I save using other photo editing apps. I wish I could upload a pic to demonstrate. If I could get this resolved I would rate the app much higher. I love this app. Super clean and versatile. Add a spot healing tool and it will literally be perfect. Was tired of VSCO.... and this app literally made it fun to take pics again. The way you can use it to capture the lighting your eyes see, sets it apart from many other photo editors! I love how you can selectively adjust different features and the navigation is relatively simple and clean! Where is Afterlight 1 ? Hi ! This is one of my favorite photo editing apps. The only issue is that when you go to albums it freezes and it doesn’t open . Also when it does randomly open it doesn’t access all the albums just the main one. Hopefully this will be resolved because I love this app. Thank You! Less than 1 yr old iPhone 8 clean iOS and it keeps crashing and screen goes black. 1 much better. This is unacceptable for a PAID app. Money black please. Snapseed is way better, and it is free. This app is lame, and the filters are cheesy. Seriously. I ended up buying the app. Best purchase. My absolute favorite photo editing app. Amazing features & runs perfectly on 10s max. Worth every penny! Love this app! Downloaded it based on YouTube clips on photo editing and it’s worked great. My pics are taken to the next level using these Afterlight features, definitely does not disappoint. 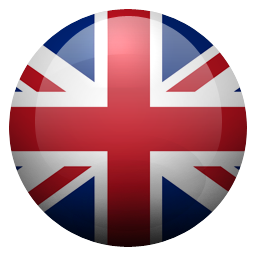 This is the BEST app EVER!!!!!!!!!!!!!! This app isn’t like any of the images you see. It’s all fake, and you won’t achieve that. Yes, you can brighten images up and darken them, but only to the whole image. You can’t do that cool photo of the girls hair on a phone, it’s not even an option. I watched a video from 2014 and it had it then, but not the type you think. You would have to edit the whole photo or retake it to fit and it could take up to 5 hours doing it. There is no blending option or blur tool so you can’t even do that, but if there was again it’s only for the whole image and not parts of it. There are good parts about this app but not many, and unless this app upgrades itself then I do not recommend it. My favorite filters are the contract scrolled all the way to the left. (to make it look old fashion)and the dust effects. I really the app but, for some odd reason when I want to put a photo from one my album, the one I have on my iPhone, it doesn't let me get the photo. I don't know why. I try deleting the app and getting it again. And I even try turning off my phone. But, it still doesn't really wanna work. I was wondering, could it be because I have and old iPhone. I have the iPhone 6. The one greatest thing about the app is it’s one-time price. I was skeptical at first, but I played around and it’s as easy as using Lightroom on desktop. It’s fairly easy to use if you’re coming from other editing softwares. And RAW support is awesome! The only downside that I have is that there is no way to see HISTOGRAMS! I have looked everywhere for it and I don’t think it’s included (if it is, I’m sorry, please help me). Hopefully, histogram support will be at least considered in future updates. Everything else seems great! I love this app because I can make it appear lighter when it wasn’t. It was worth the money. And the best app to edit photo’s that I have used. I recommend it definitely. Of course there are a lot more features than that, but that is one of my favorite. Forgive me if I’m blind but does this app not have a blur feature? Love, love this app! Helps me to make my pictures flawless and more interesting! Thank you!!! Finally an editing app that works its cheap and perfect for beginners at editing like me great for insta too!!! I just bought this app, and every single time I attempt to edit a photo, BOOM, the apps goes black and crashes. I’ve been attempting this for nearly an hour. Deleted the app then reinstalled it several times, issue still occurs. Honestly this app is super great and I love all of the new features added! One thing that I hope you can add back from Afterlight 1 are the borders. I use them for every photo and I don’t want to have to switch between each app just to add the border to it, you know? Hopefully you see this and consider adding them back. Thanks! I’ve only been using the app for a week and I love it! Implement an auto-save feature immediately! Title says it all. Fix the app. Constant crashes. Used to be really great. I’ve been using afterlight for quite a while, it is definitely my #1 app that I use for editing. I love it so much so that I actually gifted my mom this app as well so she can have a simple, yet amazing app to edit her photos with. It is super easy to navigate! But there are a few things that I think the developers should put into consideration… When using the app from the photos app on iPhone… It sometimes turns black, the photo disappears and it is starting to get a tad bit annoying at this point… I am unsure if this is just me or what, but if someone from the Afterlight Dev team sees this, I need you to try to do this… Go to the photos app, choose a photo, press “edit” on the top right of the photo, press the three dots (...) that is just left of the red “revert” button. If afterlight isn’t showing on the tab that popped up, then go to “more” on the very right, then toggle afterlight “on” , then press done, open afterlight from the photos app (don't go to the actual afterlight app), then try editing, mess around with different tools and see if the picture you’re editing randomly turns black or disappears, and if it does then can you guys please issue a fix for it? Either that or make it to where I can modify the original photo from the afterlight app so i don't have a duplicate. Finally a developer recognizes that they can provide a revenue stream the old fashioned way - by building in new features and capabilities BEFORE reaching into their customers' pockets. 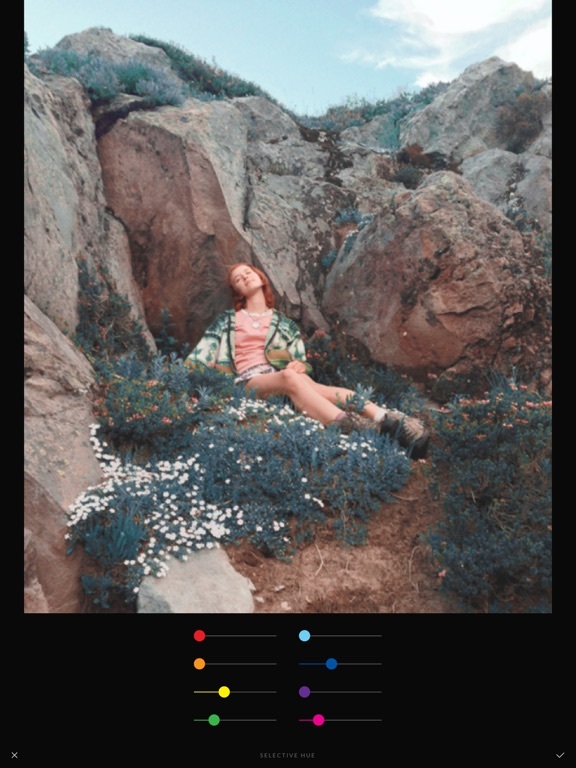 The new Afterlight isn't a breakthrough product, but it assembles features that might otherwise require several separate apps. And it isn't just that convenience -- they are competently wrapped into a new shiny package. 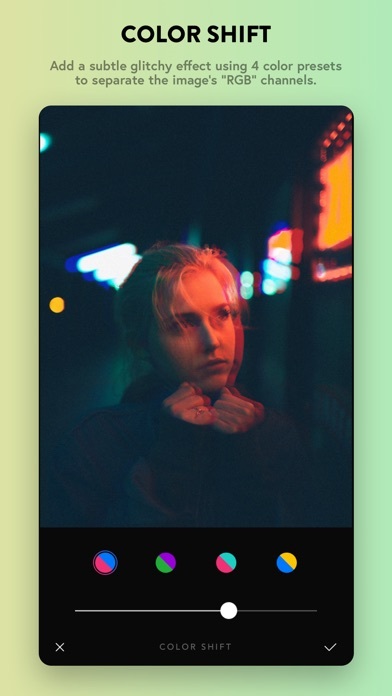 If you have the original Afterlight, and found it useful, I recommend buying the upgrade for no more reason than as a tip to the developers for a job well done. If you never used the first version, I heartily recommend adding it to your post-photo session tool kit. And to developers going out of their way to slice their apps up into half a dozen in-app purchases or even worse, subscriptions, Afterlight 2 shows that there is a more respectable way to make a living. There’s so many photo editing apps you could fill an entire tablet with them. Afterlight 1& 2 are ones I keep and use regularly. They’re good but wouldn’t call them great. None of them are. All the apps I use have tons of features that overlap but each of them has that one or two special feature none of the others has. Or they have some great filters you just can’t cut out and add to one app to rule them all. Now that’s an app I’d love to have. One app that lets you use specific features from a bunch of different programs without having to get in and out of them. I also like they haven’t tried to make this program a subscription based. Who ever thought that is a good idea is fooling themselves. Who wants to pay $9.99 a month for ever? That’s $120 a year for an app you only use occasionally. They can screw off. I’ll keep supporting apps like afterlight who aren’t trying to get greedy. I had the original Afterlight for a month or so and used it along-side VSCO until I deleted Afterlight cause I didn’t like it. I finally decided to buy the new one to see what it is all about. I highly, and I mean HIGHLY recommend this app. I just got it today and I’m obsessed. The new features are amazing, and THE FILTERS. I have so many themes I want to do for my Instagram now. I can’t express how much I love this app. I absolutely love all the tools and especially the Selective Saturation, game changer. I went back and edited some of my old photos and they look litterally 110% better. Again, as you can tell, HIGHLY recommend this, worth every penny and more. I have the iPhone 6S (model A1688), and in recent weeks I’ve been experiencing more crashes while using the app. Typically when I’m toying with the “gradient”, and “color overlay” filters. Aside from that minor inconvenience, the first Afterlight was great, this new Afterlight 2 is amazing, nearing perfect. Two years ago I had 5 photo editing apps, but because of Afterlight 2’s new features, it’s rendered three of those apps useless. The ONLY thing keeping me from deleting my second photo-edit app is it’s “focus/tilt-shift” tool, and it’s “blur” tool. That would be the only thing I could possibly imagine you doing to improve this incredible app! I’ve been using Afterlight for years, and I’m disappointed that this new version is still slow. I am a photo/videographer who had the original afterlight, VSCO, then Enlight then Polarr... but I needed something new. 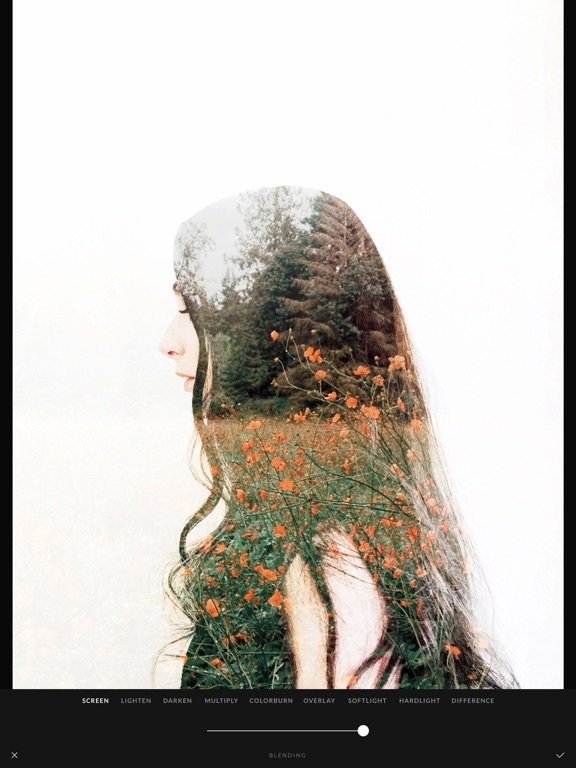 Intuitive, powerful & efficient so I eagerly(unfortunately) purchased AfterLight 2. - The tools except the selective color are not efficient & the way this app makes the shadows get very milky has me pulling out hair. The sliders are way too small, sticker have no automatic leveling & the fade isnt much of a fade but more of a dehaze. - I want to create my own filter, theres no erase tool & just overall limiting. - Compared to Polarr which edits my photo in the album with no import - Compared to Enlight allows you to erase anything on your art, true double exposure - VSCO & AfterLight 1 were nice fast tools. I was excited when i initially made the purchase however TWO days later I’m spending time not editing family photos, SEARCHING for my $3 refund. It is that serious. I’m not one to judge without advice but I’m also not a developer just another unhappy creator sick of limiting tools when this knowledge is open. Apple needs to be honest when showing us these apps & review themselves because I’m tired of getting conned. Thanks for pulling a fast one for $3 lol. I used Afterlight for years and every time I got a new phone I made sure I downloaded it. I loved it. Then I get on my phone and realize the app is not there anymore, and then... bam In the App Store there’s a new afterlight. I’m like “cool, ok. It’s 3 dollars, uh ok, but it’s most definitely probably worth it.” I buy it. I open it up to edit my picture, and everything is different. I’m trying to find my favorite filter and I just can’t. So I try to find something similar and I just stick with that. I’m actually disappointed. I feel what was so easy to maneuver through has now become so much more complex. I hope I can eventually learn to love it as I did the original, but for now I’ll be looking for new photo editing apps. Love the new app! Well worth the few dollars to have access to all the editing options that I have typically had to use 3 to 4 different apps for in the past! I know people get cranky about paying for apps but seriously, it's the cost of a cup of coffee these days, right? But you only have to buy it once! Other apps have countless in app purchases and this is a one time deal, you pay all up front and then you have it all! Well done, Afterlight! Loving the filters and the work done on the shadows within filtered pics. Looks great, user friendly, couldn't be happier with it! As another reviewer stated, there’s really no reason to get this if you have the original. I bought this partly in protest of VSCO’s walling in of new features to their annual fee. However, I quickly realized this app is largely a reskin of Afterlight 1. 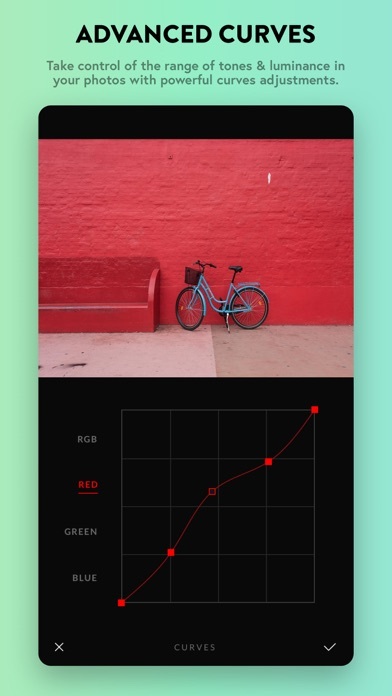 Notably, frames/borders are missing altogether; this was a feature I used frequently in Afterlight 1. Further, the quality of filters is noticeably poorer than VSCO in my option. Here, they appear artificial. I also found it difficult and unintuitive to try and create my own to save and use for future use. Overall, I’d say VSCO>Afterlight 1>Afterlight 2. 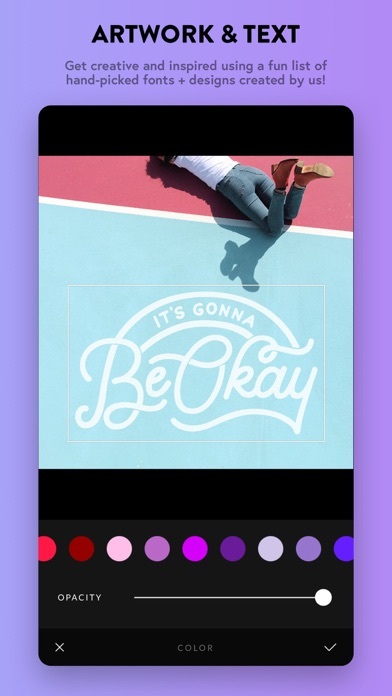 At the very least, all of Afterlight 1’s features should be included here. I hope my money might go to such additions. I’ve been using the first Afterlight, and I liked it, and used it 80-90% of the time for photo edits. 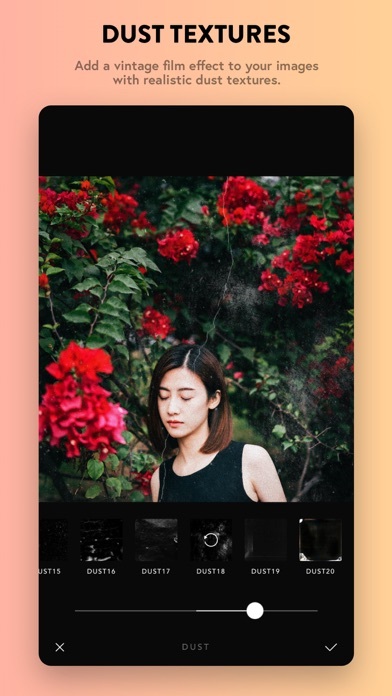 When I herd Afterlight 2 came out, I was hesitant on the getting because I was thinking that it’s going to be the exact same, with barely to little changes. Then I looked into detail, and went with it; I’ve been using this app for 3days straight for my photo edits, and I can tell you this, I’ve been happy, and the reviews about it, have been positive. I enjoy the add-ons, and it’s been by far the best. After using the original Afterlight for years, I upgraded to Afterlight 2 without a second thought. And it was absolutely better in every way. Except one. The filters. Nothing against the filters in Afterlight 2. They’re fine. But where were the familiar filters I’d been using for two years? Where was coral? Where was Bright Fire? Where was ... Captain?? I spent weeks trying to emulate those filters in the new Fusion, eventually settling on my own poor approximations. I even named one of my Fusion filters “Cap’n” to try and capture some of its magic. But it wasn’t the real thing. Photos of my kids with Cap’n just didn’t have the same rosy glow they did with the real Captain. But now. FINALLY! I’ve got Captain back. My kids’ pictures have that wonderful, magical glow again. Welcome back, Coral. Good to see you, Bright Fire! All is right with the world. Thanks, Afterlight team. 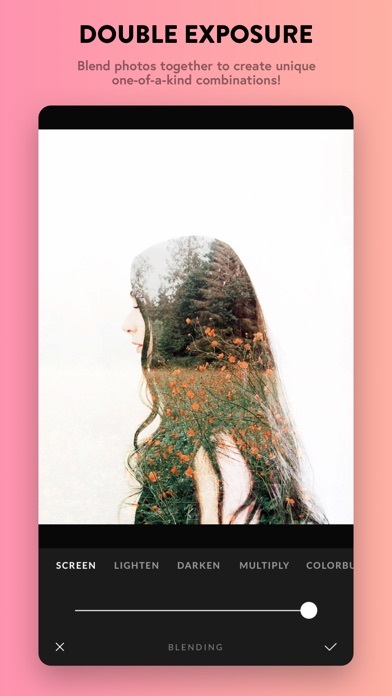 Some reviewers mentioned that the only difference from Afterlight 1 is a couple new filters — not the case! The filters may be mostly the same, but the control of the photo editing experience is vastly improved. You can now manually set your curves, view/rollback your history like layers, use blending modes on color and gradient fills, and more photoshop-like stuff. 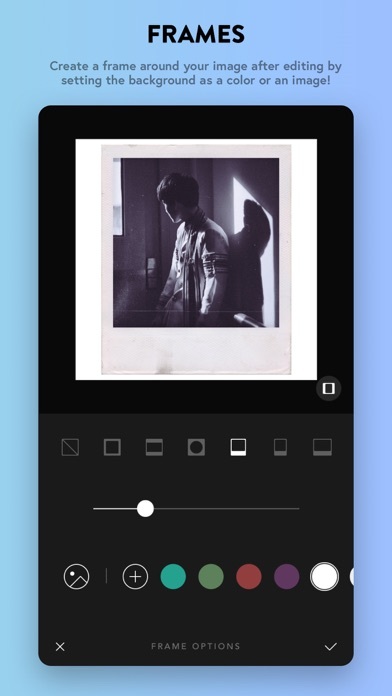 Far and away the most powerful photo editor on mobile — at least among those that have quality UIs. I’ve been using Afterlight 1 for 3 years now, just purchased Afterlight 2 last night. While not a mind blowing update, Afterlight 2 is certainly much more streamlined and easy to use. New features like selective saturation really allow me to draw attention to specific parts of an image without blowing out the whole thing. As always very impressed, very happy, and very worth the price tag. 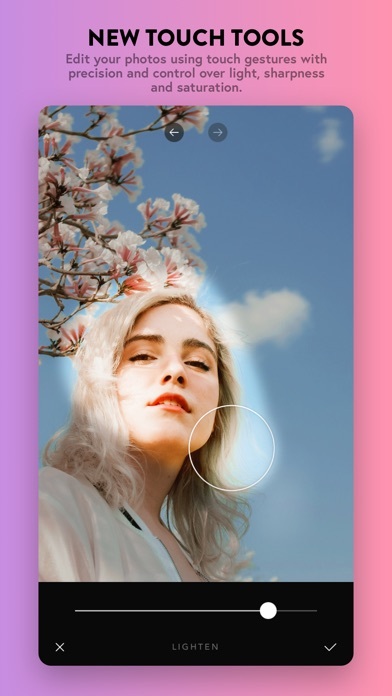 If you’re looking for photoshop designed for iPhone, you’ve come to the right place. Just like the previous version Afterlight 2 is my go to tool for working on photos. I don’t even think about it. The feature set is perfect and the workflow effortless. It doesn’t make me think: when I want to modify a picture I don’t have to worry about what to do to make that happen; I can concentrate on the work. The tool stays out of my way. It seems like a simple thing, but that sort of simplicity I excruciatingly difficult to produce. I’d pay twice the price without blinking. This might be the most complete photo editing app available on the iPhone and it has an extremely gentle learning curve. A person who has never edited a picture in their life can pick this app up and create beautiful pictures. That being said, I have 2 VERY SMALL issues with it: 1. Finding specific albums is very difficult because iPhoto events are in the list of albums. I need to scroll through hundreds of iPhoto events to find the album I need. 2. Pictures aren’t automatically saved to an album. For example if I save a photo from AppExample it will go to the AppExample album automatically which makes finding it much easier. But these should be relatively easy fixes for the devs to implement. (I’m beggin’ ya, devs!) Overall, I highly recommend this app. Afterlight 2.0 is fantastic!! I have used Adobe Lightroom CC for years. And to be honest, it is an exceptional app. BUT, I hate the subscription model. HATE IT. Then I discovered Afterlight. I bought version 1. Then came version 2. What an amazing improvement. Amazing! It works seamlessly with Photos. I can switch between the two, using the best features of each. Then end result is superb. And the final printed product is excellent. Why pay a monthly subscription when this 5 star is a mere $2.99. Works Exceptionally and Feature Req. Love the simplistic yet effective design, thumbs up to the developers. The one main improvement I could see would be at the end an option to modify the current photo rather than having to save it as a new photo. Snapseed has this if you need an example. It’s much nicer when you don’t have delete the old photo, especially when your only making slight changes. But overall, thanks for such a great app. I have been looking for an app literally just like this for years and I had settled for vsco but then suddenly stumbled upon this hand crafted piece of art formed by God himself. It gives you all of the features vsco allows plus ten billion more. And without having to pay for all of those filters. This is a one and done payment of so little and if you have even only one photo you’d like to edit, buy this app. In my mediated textuality course we cover text, image, sound, and video production and this application was presented in a tool review discussed over image. I enjoyed the presentation and sample pieces provided by the presenter. I decided to make the purchase of only 2.99 and am not disappointed yet. The application never exits out, so many ways to edit or dabble with and overall I think it’s a great way to add unique and simple editing touches! I recommend this! The one thing this app really needs to do is show the histogram. This is the reason I can’t give this app 5 stars. It would also be great if you added a way to input exact numbers or made a sliders a bit less finicky. That being said, kudos for selling a complete app for a single payment, unlike pretty much all the others which sell you half an app then ask for more money for features or have some terrible subscription model. 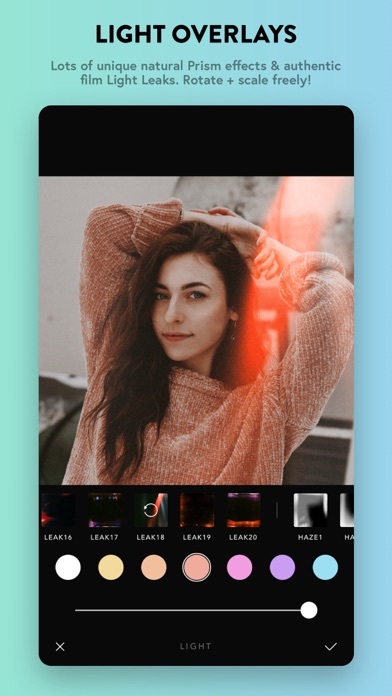 This is a great photo editing app that doesn't bait and switch you. It has a strong set of tools and a solid UI Only suggestion: non-destructive crops. Sometimes I crop and then edit and decide to go back and change the crop. It seems like cropping needs to be the last step of your workflow because you can’t recover anything you cut out later. I have had Afterlight 1 since it came out, and I absolutely loved it. I didn’t see a reason why the creators needed to replace it all together with this version. Because Afterlight 1 is no longer available in the App Store, I can no longer use the features that were my favorite: like the borders that looked like polaroids. If I can choose one thing to add to this version it would be that! Otherwise I will unfortunately be saying goodbye to this Afterlight. I don’t like the new light leaks (why not keep the old ones and just add new ones? ), the layout, and the new filters. Please bring back some of the old options!! So I paid 3 dollars for this app after ready the reviews and I was excepting it to be great but instead the app has crashed 3 times and my phone has started lagging. I also thought there was a way to change the color of the light leaks but unlike afterlight 1 there is not which is super disappointing. None of the filters are working either and the app all together is just laggy and glitchy. It seems like a great way to edit pictures but unfortunately for me it’s not working. I have to up my four-star review to a five because Afterlight’s devs really keep coming through. Enlight is still the app to beat, but I’m hopeful that, given the rate and quality of updates, Afterlight 2 will be my primary editing app in the near future. Fingers crossed, but until then, it’s still a stellar app that’s absolutely worth the few bucks they modestly ask. I am a photographer and typically don’t like adjusting my photos with filters but that is what is in these days. This app is super easy to use and gives you the look of using film photography with the light leaks and grain specs. I would absolutely recommend it to anyone professional or not. It gives your images that extra ummmph they just need sometimes. My previous concern with the export size limit has been addressed and images can be exported as large as 6144x6144 pixels in size which is greater than 24 mp. Much more usable. It has a very large variety of tools that allow for just about every kind of enhancement or modification. Much better than before. Now if the would just arrange the tools in a more logical order or better yet allow users to arrange the tools and hide tools they don’t use, it would be great. Current tool arrangement is haphazard and random. The original Afterlight has been my go-to for years. So at first, I was pretty upset about it finally disappearing, which forced me to buy this replacement when I got a new phone. After using it for the first time, though, I’m so impressed at the new features (and keeping of the old ones that I’m used to) that I have no buyer’s remorse. A great photo editing tool. I have been using this app for a year or so now and I am IN LOVE WITH IT. It is the perfect mobile app to edit all of my iPhone photos. I have my favorite filters but I always like to change it up too. I use this app to edit my screenshots I take for my fan account and I get a lot of compliments on my editing. Huge fan and I’ve tried tons of photography apps. Where is the framing tool?? One of my favorite phone editing apps for ease of use, filter presets and simple framing. Design is great and a pleasure to use. That being said the app can be buggy, stall and freeze up on my iPhone X. The camera roll can take awhile to load and the confirmation modal always hangs after an export and its difficult to get a good flow going. Sometimes I just bail on it and it’s a bummer! Would to see performance improve.